Great for the big jobs. We have tipper truck available. An Izuzu NKR with 1.8 tonne payload. Suitable to be driven by a car licenced driver. 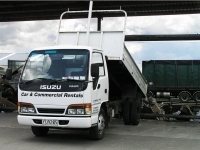 Hosting plenty of grunt and capacity, the Tipper Truck is a workable choice.